How will a Dermal filler help me? Dermal fillers are popular treatments for wrinkles and facial lines such as laughing lines. Dermal fillers are also effective for facial enhancement such as increasing fullness of narrow lips, enhancing sunken cheeks and can even be used to contour the bridge of the nose. Dermal fillers are generally very safe. Safety depends on the experience of the injector, area being injected, and the technique being used to inject the filler, as well as the type of filler used. Every face is different and volume loss in face and skin laxity varies from person to person and with each passing year. Facial symmetry and facial proportions play a major role in deciding how much filler you will need per area. You can plan your treatment and the time time frame the treatment is done based on your schedule and budget. What are the different dermal fillers used? HA filler is a natural content in our body. Results last 6 months to 18 months, depending on the area treated and types of filler chosen, If you do not like the results after the treatment, doctor can reverse them immediately. Examples: Juvederm, Voluma, Restylane, Perlane, Teosyl, Redensity, Baletero. This type of filler stimulate our skin to produce own collagen. Results may last 18-24 months. Examples: Radiesse, Sculptra. 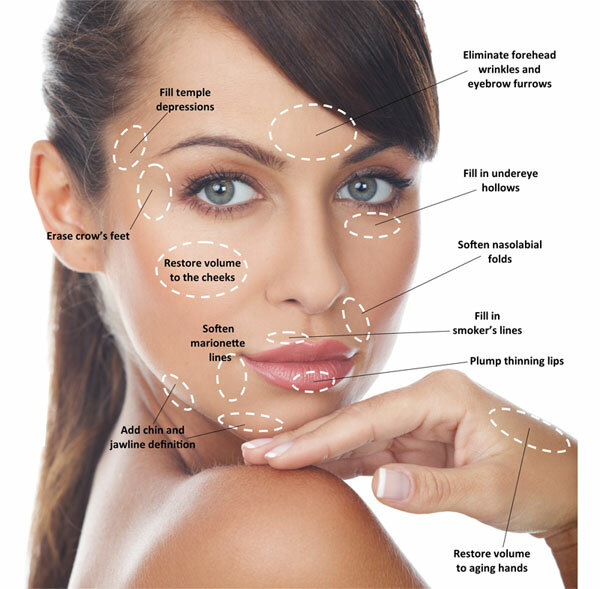 How is Dermal Filler introduced under the skin? The Microcannula technique has revolutionized facial re-sculpturing by providing trained physicians with a new non-traumatic method of performing facial fillers injections. This advanced technique uses a blunt delivery instrument under the skin with reduced chances of bruising and swelling.